Providing best of breed Emergency Notification Service and control, StaffAlerter is the only solution you need. Anyone who is responsible for keeping groups of employees, customers, students or parents informed, needs the communication power of StaffAlerter. Developed originally for the K-12 market, StaffAlerter by virtue of it’s advanced distributed architecture design leverages the latest in IoT technology, Cloud processing and advanced communication services assures any message for any person or group will be delivered regardless of the condition of facility power or network infrastructure. 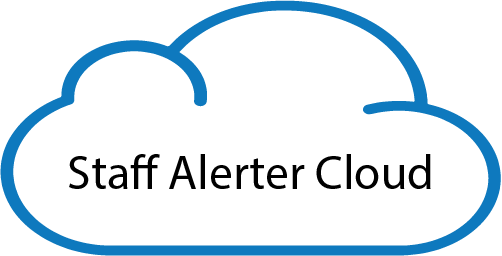 What makes StaffAlerter better than the current Emergency Notification Systems? The StaffAlerter appliance is located on the premise and connected to wi-fi or cellular networks processdirectphysical inputs from devices or people in the facility. These events activate custom rules managed by the customer which are designed to send alerts to staff, control outputs as needed and communicate to other StaffAlerter appliances located on the network. Custom URL portal allows customers to create and manage Web Action Keys® which can be activated by any device that can be reached over the web. Designed with ultimate survivability in mind, Cloud Action Keys® are user created and controlled, allowing messages to be sent to users or groups, even during facility system failure, this capability allows StaffAlerter to be on duty 24/7 regardless of facility status. Only StaffAlerter combines all these functions into one easy to manage, easy to deploy system capable of serving a small site with a small group of contacts through an enterprise of any size or spread across any region from a single Web Portal. StaffAlerter was designed to operate in any condition and with any level of network access including a cellular option. Power failures, network outages or regional disasters won’t leave you without the ability to communicate based on the Cloud Layer.